Uganda, pearl of Africa, was the team’s third experience in the continent and has been the milestone in our trajectory. Why? Because it was in Uganda where we met Victor Ochen, one of the most relevant activists in Africa. He was the first Ugandan and the African youngest candidate to the Nobel Prize for peace. He is currently the United Nations Ambassador for Global Projects. After a childhood disrupted by war, becoming a child soldier himself, in 2005 he set up the NGO ‘African Youth Initiative Network’. 15 years later, Ochen is still working tirelessly to help nowadays young people become agents of peace. Fascinated by the solidary task we had been developing in Africa, Ochen honoured us as Ambassadors of the challenge he is promoting inside the United Nations through his association called Peace, Justice and Security Foundation. This foundation works to promote peace and social inclusion for a sustainable development, making it possible to get access to justice and to build up inclusive and responsible institutions which can be effective at any level. In this occasion, we played against Kampala Capital City Authority FC, winner of the Ugandan Football League in the years 2013 and 2014. The match took place at the Nelson Mandela Olympic Stadium, with a capacity for 45,000 spectators. Unfortunately, 2 hours later, U21 Uganda’s National team was going to play against Ruanda, and the African Football Federation establishes that, for safety reasons, no match can be played in the same stadium 2 hours before an official one. The moving moment took place when we gave our fellow players and managers some roses and some books, as the match was going to be played on 23rd of April, Sant Jordi’s Day, one of the most important days in the Catalan calendar. We were unlikely to forget one of the most beautiful traditions from our country, not even being thousands of kilometres away from home. That is how we came up with the idea of handing in some roses and books to show some of our Catalan traditional culture. 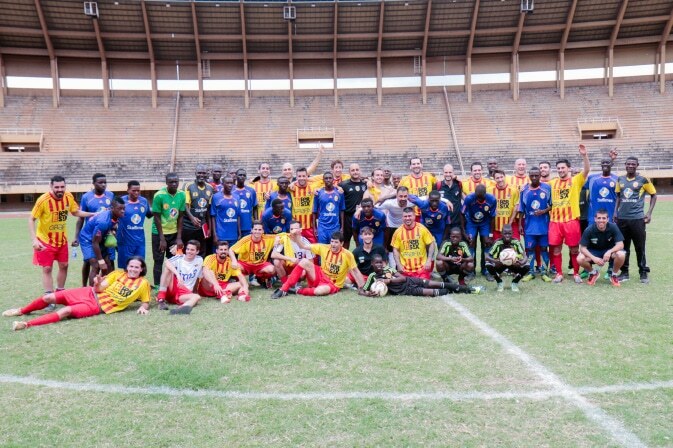 We were beaten by Kampala Capital City Authority FC, but we utterly enjoyed the experience. The welcome we got from the media and from our rival’s supporters was incredible. 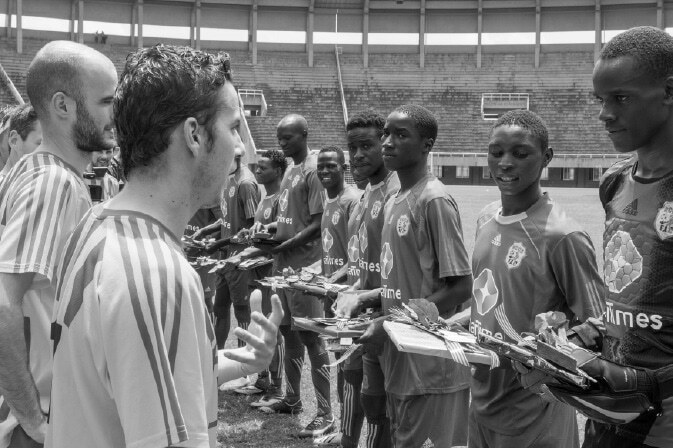 The day after our arrival to Uganda’s capital city, a press conference with local media was held to present the match. In the streets, people were like mad. They stopped us every step we made asking for autographs and pictures and they sang and danced in our honour. This was a record trip! Our expeditions to Africa are becoming more and more well-known. As a result, people from the whole Vallès region are throwing themselves into the initiative. 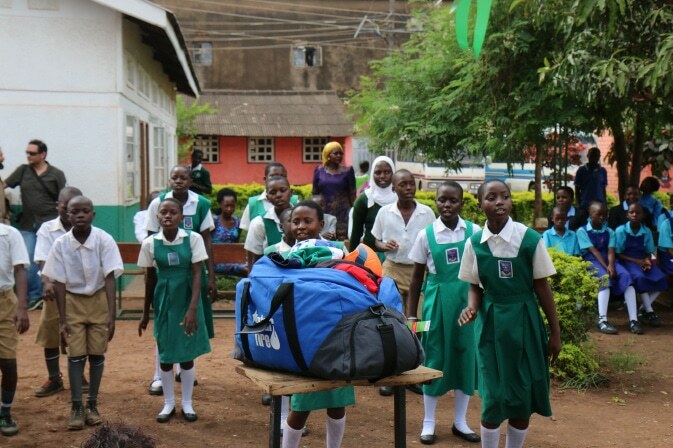 Thanks to the selfless cooperation of many people and companies, we were able to fly to one of the poorest countries in the world with 600 kilos of sport and school equipment and more than €1,500. Part of the sport products were given to the Kampala Capital City Authority FC youth academy to help their young promises to have a better formation. The rest was given to two schools in the country. One of them takes care of deaf-mute children, where we learnt some of their sign language. The other one was an orphanage, where we were welcomed by the Ugandan National Anthem sang a capella. We played with the kids in both institutions, we were toured around the facilities and we shared great moments with all of them. What must be especially mentioned is our visit to the NGO Petits Detalls, a non-profit association that promotes humanitarian aid and international cooperation in Uganda. With them, we visited one of the two huge projects held by its founder, Quico Germain, aged only 20: Mupenzi. Mupenzi is an orphanage sheltering 40 children from 3 years old, who used to live under subhuman conditions, and who nowadays, thanks to many people’s help and hard work, can enjoy a worthy and fair life. They get an education, they get fed, they have medical assistance and, the most important of all, they will be able to decide what their future will be. This was a visit that made a mix of emotions show through; happiness, tenderness, sweetness, gentleness but also pity and shame when we could realise how poor the country is. Do you want to see how our players lived this experience? Have a look at this moving documentary VOTV made of it. Enjoy!